If you have greenish black stuff on your concrete patio, it's probably mold, mildew, or moss. Damp or moist conditions from rain or humidity can encourage mold and mildew to grow in those nooks and cracks of concrete pavers or bricks. It's important to find a sure way to remove it that won't destroy nearby landscaping and harm the environment with a blast of harsh chemicals. This method uses natural, super-versatile ingredients in most homes, like vinegar and Borax. These cleaners should be able to tackle most cases of mold or mildew. The frequency of cleaning will depend on how much mold, mildew, or moss there is and how often it comes back. Applications may need to be repeated for especially moldy areas. Other times, this could be done once a year for a spring cleaning every season. Remember, it will be worth the effort when guests come over and there will be no embarrassment of the unsightly mold. Dissolve 1 cup of warm water together with the white vinegar and Borax. Pour the solution into a spray bottle or keep in a bucket and use a sponge to apply. Using a power nozzle or a strong spray, hose off the area that needs to be clean. Get it completely wet. Apply the solution with a sponge or spray bottle. Do one area at a time. If you have a large area, break it into manageable parts. Allow cleaning ingredients to permeate surface(s) for a few minutes. Give it time to work. If the mildew or moss is especially aggressive, allow the solution to soak in for a longer amount of time, like a half hour or more. Don a pair of waterproof rubber gloves, get down on hands and knees (here's where knee pads might come in handy), grab the hard-bristle brush, and start scrubbing. Scrub in a circular, clockwise, or counterclockwise motions, tackling about a 3-foot x 3-foot area at a time. Dip the brush into the solution if it starts to run out. Keep going until some progress is accomplished. Make sure to tackle the entire green-infested patio, walkway, or surface. Just think how strong that scrubbing arm will be. Switch arms for an evenly toned workout. 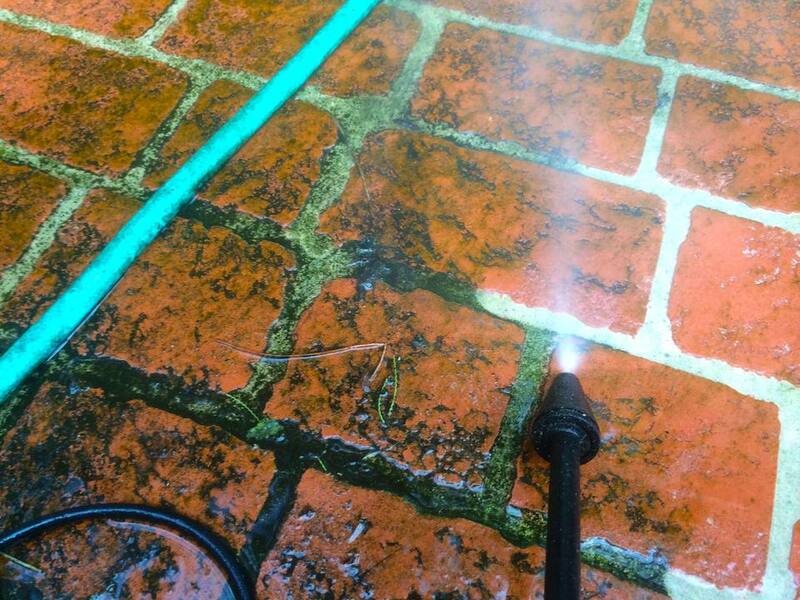 ﻿Using a strong spray, hose off the patio or surface that you just scrubbed. If you followed directions, used the right amount of pressure while scrubbing, and didn't slack off, the green patio should start to look concrete-colored again. Choose a time of day when there is as much sunlight as possible to dry the rinsed-off patio. Moss and mildew love dampness and shade. Check back in a week to see if further cleaning is needed. For those who followed the instructions, scrubbed hard, and used the solution a few times without much luck, know that sometimes tougher measures are called for. A product like Wet & Forget should do the job. While the label says it is bleach-free, phosphate-free, non-acidic, and safe near plants and on all outdoor surfaces (when used as directed), do take caution when using this product. Wear rubber gloves and avoid unnecessary dripping into your garden or grass. Follow the directions on the container of the cleaning product, making sure that the previous cleaning solvents have been thoroughly rinsed off with a strong blast from the hose. While the product used may claim that scrubbing isn't necessary, it will probably be necessary to have those sleeves rolled up; continue to scrub the moldy/mossy area until it's free of all the green stuff. Try revisiting the area in a week or two to keep on top of the mold and mildew. Persistence will pay off.